It is near continual night in the Arctic this time of year, and the ocean is a solid sheet of ice, covered with some snow. In fact, one would not guess of the presence of an ocean if simply looking at the surface. But in the summer, when the sun shines much of each 24 hour period (although close to the horizon), the ice loosens and melts, and the waters appear. Icebreakers can claw their way through, revealing to the casual observer that yes, there is a sea underneath, and several routes that commercial ships can pass. 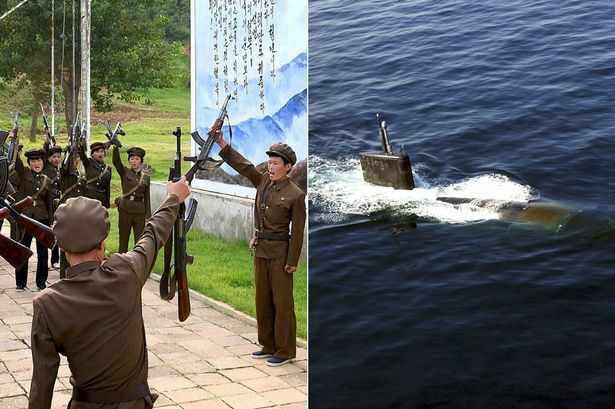 In fact, the numbers of ships that navigated a sea route across the "top" of the earth last summer was up to 46, a rise from 4 in 2010, and 34 in 2011, according to a recent newspaper article. It is this development that is worth noting. The commercial possibilities of using a polar sea lane present opportunities for some countries, while posing challenges for the environment. But, according to the article, the increasingly ice-free route runs from Europe to Asian markets through the Bering Strait, which divides Alaska and Russia, and it can be 40 percent shorter than the southern alternative of shipping through the Suez Canal. Following the red line from left to right, this polar route is so much shorter than the blue line showing the shipping route through the Suez Canal. The Suez Canal sees 18,000 ships a year passing through, so it will be sometime before Arctic traffic becomes a competitor, however, the key players in the rise of traffic are Russia and China. Russia is seeking to develop its Arctic oil and gas reserves, and China is ready to buy energy. While both talk a good game when it comes to environmental safeguards, this is an opportunity that neither will pass up. Apparently there are several potential polar sea routes, Alaska development officials were hoping that ones closer to the northern boundaries of the state would win out, creating their own growth. 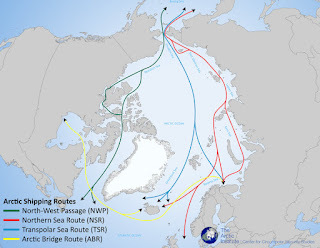 But the Northern Sea Route (NSR) seems to be the front runner. The Northern Sea Route, hugging the Russian/Scandanavian coasts is shown here in red. Polar wildlife will be more exposed to potential oil accidents, and debris from civilization - but that seems mainly a concern of Western environmentalists. Tankers may become a more common sight at the North Pole during the summer months. Teatree is not sure he'd characterize this increase of sea traffic as progress, but it is certainly more likely.